When Oklahoma City Thunder superstar Kevin Durant becomes a free agent next summer, he will do so with anywhere from five to a dozen franchises (if not more) convinced that they must make every possible move and pitch to get him to join them. Historically exceptional players do not hit the open market very often, and it makes sense that they would inspire excitement from fans and basketball professionals alike. 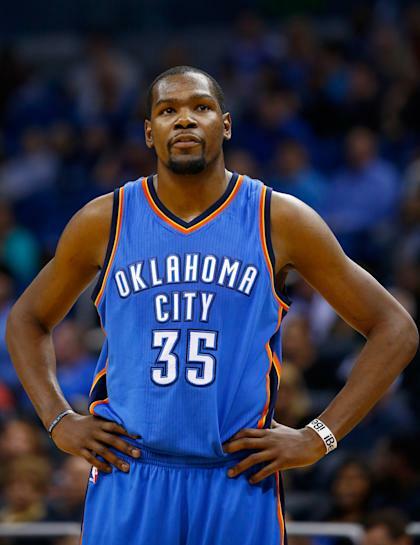 Kevin Durant: Uh, just, I think we should … you know what, I'm not even going to answer that. I'm not gonna answer that one. Along with Matty Ice [Thunder PR man Matt Tumbleson], I've got two people that I trust with my life, my agent and my manager, who's my best friend as well. I trust them with my life. So if you hear sources or anything, don't believe it if it didn't come from them. I tell them everything. We bounce ideas off each other. We collaborate on a lot of different things. They give me advice. so throughout this year, if you hear sources from anybody, it's not true, unless you hear it from Charlie Bell, Rich Kleiman or Kevin Durant. Durant's advice is noble and almost certainly won't be followed by anyone surrounding the NBA. As we have learned from LeBron James's two recent free-agent frenzies, the best players in the league command widespread speculation. There is a market for any talk regarding those stars, and if someone stops relaying rumors then seven more willing conduits will pop up as replacements. However, there is value in Durant's comments even if we cast them as wishful thinking. Durant has essentially defined his inner circle for free-agent decisions as Charlie Bell and Rich Kleiman, which means that any report that does not mention either person by name can be deemed worthy of skepticism. It's obviously possible that both Bell and Kleiman will serve as anonymous sources in some cases, but there are few ways to determine if and when that's the case. That means we will see a lot of reports featuring uncertain levels of truth, just as we have with so many big-name free agents before. Thanks to Durant's response to Berger, we can look at these reports for what they often are — isolated missives that combine to create a confusing but still readily enjoyable side-story throughout the NBA season. Durant has essentially told us not to take forthcoming reports seriously, which in turns frees up everyone to look at them as a delirious mess. That situation is still undoubtedly frustrating for Durant, his camp, and the Thunder, but it makes it possible to live in the rumor mill without losing our minds.